These are the official guidelines to be followed in Jewish evangelism. Grounds is also Corresponding Editor of Christianity Today. Frank Gaebelein––a possible relation to Gretchen Gaeblin Hull–– Frank Gabelein was an Associate Editor at Christianity Today, a chairman of the style committee for the "Holy Bible, New International Version/NIV, 45 year member of the board for the American Tract Society/ATS [see ATS board of Reference] and was first headmaster of Stonybrook School, NY––credited with being an influence on former Roman Catholic Walter Martin’s conversion to Christianity. See Ministries to NU Religions, Christian Research Institute, Walter Martin, Hank Hanegraaff and associates. …the largest international Evangelical conference/symposium on the Cults, the Occult and discernment issues ever to be held in the history of the Midwestern United States. People came from Canada, England, and Scotland as well as from all over America. It was co-sponsored by TV 38 in Chicago, WQFL and WGSL radio stations and First Evangelical Free Church all in Rockford, Illinois. It was co-hosted by The Institute For Christian Apologetics…The Steering Committee consisted of Dr. Gordon Lewis, Eric Pement, and Rev. Kevin S. Johnson. For more in-depth information on EMNR’s Rockford Conference, click here. Editor’s Note: Wayne House and Eric Pement are ICA board members; both are EMNR board members. ICA’s first endorsement came from Walter Martin, Christian Research Institute/CRI. Death of a Guru by Rabi R. Maharaj with Dave Hunt. Ronald Enroth was a speaker at EMNR’s first conference, the landmark Rockford Conference on Discernment and Evangelism, 1989 [as were Rabi Maharaj and Bob Burrows from Spiritual Counterfeits Project/SCP. Enroth has been a speaker at subsequent EMNR conferences; one in 1995 and the other in 1997. Jewel van der Merwe who heads Discernment Ministries was an EMNR speaker in 1994 and 1996. John Ankerberg, associate and friend of Dave Hunt and a member of the Council for National Policy was also a speaker at the 1996 conference. Albert Mohler, President of the Southern Baptist Theological Seminary* spoke at the 1998 EMNR conference. *Both seminaries are members of the Rockefeller-affiliated Assn. of Theological Schools/ATS [ecumenical accrediting agency for seminaries]. Norman Geisler, who has appeared on the Christian Research Institute/CRI JOURNAL masthead as Contributing Editor since 1989 and is President of Southern Evangelical Seminary [see SES Advisory & Board of Reference below] spoke at the 1997 EMNR conference. Norman Geisler received his PhD. in philosophy from Loyola University* Chicago [Roman Catholic]. EMNR was set up as a Lausanne-oversight ministry to oversee other member ministries––as long as they agree to sign on to the Lausanne Covenant, and the EMNR Guidelines. By signing on to the EMNR requirements, EMNR member-ministries are in actuality outward expressions of EMNR…THEY ARE EMNR. Therefore, people who participate at their conferences––EMNR’s or EMNR member-org conferences [knowingly or unknowingly] identify themselves with Lausanne’s EMNR and all that it represents. I have been Executive Director of EMNR since 1997 and during my tenure CRI has not been a member nor have they applied for membership. There is nothing in the records I have that indicate CRI was ever a member of EMNR, however, this does not mean that they were not members at some point, particularly in EMNR's formative years since Walter Martin was part of that group which were first part of EMNR. Bear in mind that in those days membership was less formalized as there were very little in the way of membership requirements. When and why CRI ceased to be members I could not tell you as there is no record of such. Elliot Miller, who is on the CRI staff did serve as a Board Member of EMNR for a few years in the mid 90's however he resigned from the Board due to his increasing workload at CRI not affording him the time he would need to serve on the Board. Even though Mr. Miller served on the EMNR Board, CRI was not a member of EMNR during that time, nor did they apply for membership. 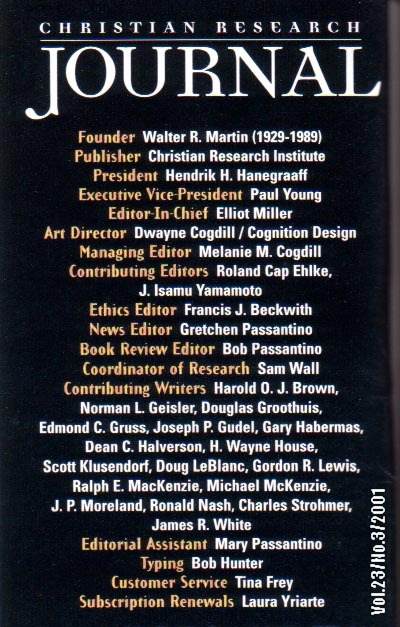 The Christian Research Institute/CRI masthead prominently displays the name of Gordon R. Lewis as contributing editor for the CRI JOURNAL. Lewis’s name has appeared through the years on the CRI masthead beginning with the Fall 1992 issue of the Christian Research Journal. There is no question that EMNR and CRI share an inter-locking directorate which is tied to Lausanne. President of EMNR John Morehead is on WF staff, Bob Bowman—Institute for the Development of Evangelical Apologetics'' (IDEA) and Atlanta Christian Apologetics Project/ACAP; Bowman attended Fuller Theological Seminary.
? Apologia––Rich Poll, Ron Rhodes, Paul Carden, Alan Scholes; Poll and Scholes have direct ties to Campus Crusade for Christ. Apologetics Research Resources on Religious Cults, Sects, Movements, Doctrines, Etc. Anton Hein is a moderator with Rich Poll for AR Talk. Hein has a questionable past. Apologetics Index (apologeticsindex.org, countercult.com, cultfaq.org) provides 11,223 pages of research resources on religious cults, sects, new religious movements, alternative religions, apologetics-, anticult-, and countercult organizations, doctrines, religious practices and world views. These resources reflect a variety of theological and/or sociological perspectives. Apologetics Index also includes ex-cult support resources, up-to-date religion news (ReligionNewsBlog.com), cult news, articles on Christian life and ministry, and a variety of other features. Poll Leaving Christian Research Institute to work for Campus Crusade¹s International School of Theology [ISOT]. 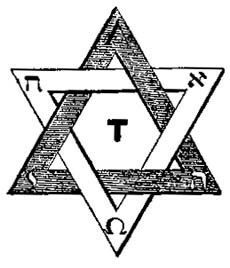 Int’l School of Theology [ISOT] is a member of the Rockefeller-affiliated Assn. of Theological Schools [accrediting agency for seminaries]. Anton Hein [Apologetics Index] a contributor to CRI; Poll recommends books from Tavistock Institute, Gordon Melton and Anson Schupe [CESNUR]; Wellspring’s Larry Pile a contributor [Pile was/is intelligence; see Pile BIO]; Irving Hexham’s NUREL web site mentioned. Dean Halverson, International Students, Inc. The EMNR 2002 Conference included Irving Hexham and Gordon Melton as speakers. Eric Pement and Bob and Gretchen Passantino––both Passantinos have been Contributing Editors to Christian Research Institute’s CRI JOURNAL since 1987 and earlier. Ed. Note: FACM conference speakers have included Gary Kah, Dave Hunt, Ron Rhodes /Apologia, John Ankerberg/CNP [1999 FAC Conference] Phil Roberts , EMNR board member and director of SBC Interfaith Evangelism––member org of EMNR. Gary Kah’s Hope for the World participates in a web alliance with FACM.